STATESVILLE- Mariam S. Pardue, 91, passed away on December 11, 2017 at Gordon's Hospice House. Born on June 12, 1926 in Catawba County, she was the daughter to the late Joseph and Susan Beatty Sherrill. Mariam graduated from Cool Springs High School then attended Mitchell College. She was employed with Merchants & Farmers Bank which later became NCNB for over 30 years. 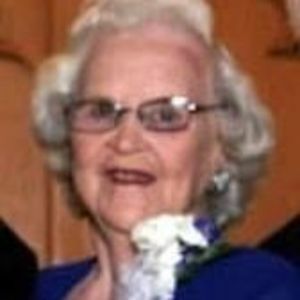 She loved flowers, gardening, quilting and her grandchildren. She was a former member of Race Street UMC and later became a member of Bethlehem UMC. In addition to her parents she is preceded in death by grandson, Josh Pardue; brothers, Jack, Joe and Riley Sherrill and sister-in-law's, Pat and Barbara Sherrill. She leaves behind to cherish her memory her loving husband of 64 years, Bill Pardue; sons, David (Roxanne) and Neill (Tonya) Pardue; grandchildren, Sarah Beth (Lee) Keller, Amanda Kay (Mark) Loring, Kendell O'Neill Pardue, Lauren Milwood, Kyle Milwood, Cody Richardson, Michael Richardson and Heidi Ladlee; six great-grandchildren; brother, Bill R. (Norma Jean) Sherrill; sister-in-law, Evelyn Sherrill and many other loving family members. A funeral service will be held on Friday, December 15, 2017 at 2pm at Bethlehem UMC with Rev. Heather Kilbourne and Rev. Olin Isenhour. Burial will follow in the church cemetery. The family will receive friends from 12-1:30 pm in the CLC building prior to the service. Memorial may be made in Mariam's name to Bethlehem UMC 607 Bethlehem Road Statesville, NC 28677 or Iredell County Hospice and Palliative Care 2341 Simonton Road Statesville, North Carolina 28625. Bunch-Johnson Funeral Home is honored to be serving the Pardue Family.